M.I.A. : 'How Can The West Turn People Away?' The London-born, Sri Lanka-raised artist has made a habit of crossing borders in her life and in her music. In her latest video, she wonders why those borders exist at all. M.I.A. in the "Borders" video. M.I.A. 's story is one about identity, and about constantly being on the move. She was born in London but spent her childhood in Sri Lanka, where she survived a fierce civil war. Her father fought alongside separatist rebels. That conflict, which would go on to last 25 years, ignited a mass migration of tens of thousands of Sri Lankans, not unlike what's unfolding across much of the Middle East and North Africa today. "We attempted to leave about four or five times, and every time we'd get stopped," M.I.A. said in 2013. "And they would stop the bus and take all the men off the bus, and we never saw them again." 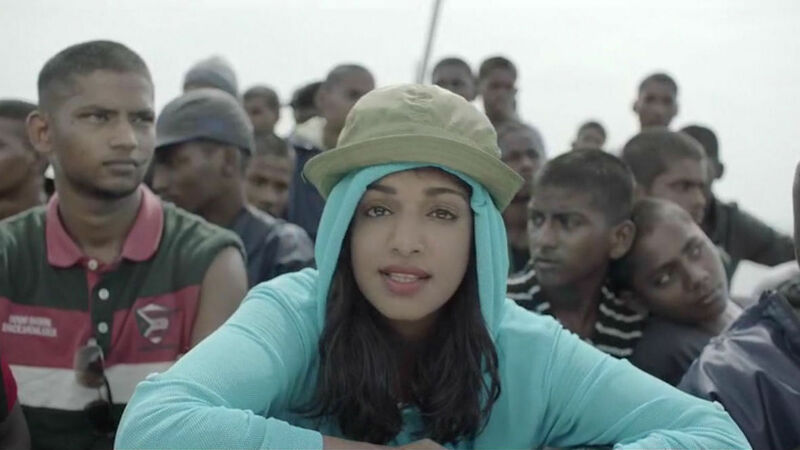 In the midst of today's debate about how to handle a surge of migrants, it's no surprise that M.I.A. would weigh in again, this time with "Borders." The video is visually stunning, featuring young men, clearly migrants, as they travel on land and by sea, and as they feverishly climb barbed-wire fences. M.I.A. says life was not that different for her growing up in Sri Lanka. "It was pretty bad," she tells NPR's David Greene. "There was definitely no international eyes looking at the situation, you know. Luckily, Britain at the time opened its borders and during that slot of, you know, a few months, my uncle found my birth certificate, because I was actually born in England. Through being born here, I was able to help the rest of our family come with us. When we came, we didn't have any connection to Sri Lanka and any connection to the experiences we had because they were pretty rough. "We fully embraced being British. One of the reasons I loved being British at the time — the music scene at the time was really diverse. I was exposed to hip-hop and Jamaican dancehall and house music and drum-and-bass — these kinds of things which were all born out of mixing of different cultures. That's kind of what England represented to me." Across generations, M.I.A. says she sees a constant. People in difficult places around the world are drawn to the West, thinking that if they can reach there, they'll find happiness. Pop culture has certainly played a role. "My uncles grew up watching James Bond movies or movies in the '50s that were being churned out by Hollywood," she says. "They were like, 'Oh, I want to do that' — wear shades and drive a sports car and, you know, be James Bond. And it's just how creativity works." M.I.A. says she feels like she plays a role in creating that draw today. "I think it's cause and effect," she says. "As a musician, I feel like we are part of promoting ideas to people. You know, ultimately we fight to get what we do in the West into the homes and the screens of every single person on the planet. We want to make money off it, and you want to sell 50 million Taylor Swift records to people in Africa. Obviously, some of the kids are gonna say, 'Okay, yeah, I want the dream,' and you've got migrants who believed in the aggressiveness of our sale of democracy. We can't really blame people when they are ready to embrace it. "If the West is so deliberate in promoting its brands and is using art and culture to inspire people's dreams," she asks, "how can the West then turn people away?" She also wonders, given how virtual borders in music and information have fallen away, why borders between people can't disappear, as well. "You don't put the borders on Apple, you don't put borders on YouTube, and you don't put borders on MTV," she says. "So to make the borders even taller when actually what the creative world is doing, or the business world is doing, is actually the opposite, then you're always going to have this problem."